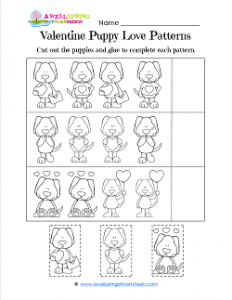 This Valentine puppy love patterns worksheet has what looks like the same puppy in different poses for Valentine’s. He’s got a heart in his hands, a heart balloon, a heart on his shirt, and his thoughts of love. He’s ready for the big day, wouldn’t you say? Kids look at this sweet-hearted puppy in each row an decide which one comes next. They cut out one of the three puppies at the bottom and glue them in place to complete the pattern. When kids are done you can have them color the puppies, or you can have them just color all his hearts.